Why are you in America? First came my maternal grandpa's mother's family from England before the British colonists evaded paying their taxes. Awhile later, grandpa's paternal grandmother was given the money to pay the families taxes in Ireland, but decided to use the money to come to America instead. My maternal grandmother's family came from Eastern Europe on both sides only a few generations before my Grandma was born. My dad came to America as a little baby with my grandparents after World War II. Being Jewish, they lost most of their families and lived in Italy together until they came here. I'm in America because I was born here. Sometimes being American makes me feel weird. When I was in France and England I was embarrassed by my accent and the large group of hung-over teenagers I was traveling with from my high school. My friends and I avoided alcohol, trading it for meals in cafes where we were mistaken for Canadians. In Asia I felt like I was a spectacle, the light-eyed Western woman. When people ask my nationality here I get uncomfortable because I am American, but I know that they expect me to say Irish or Hungarian. Why do people do that? I've never been to Ireland or Hungary, but I've lived here for all of my 22 years. Anyway, maybe someday I'll move to another country but this will always be where I am from. 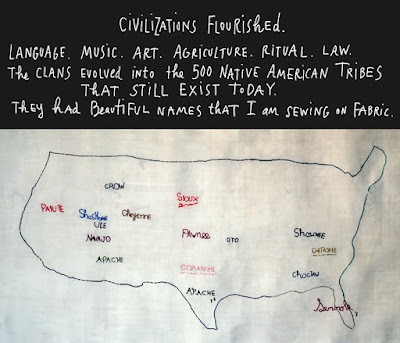 I want to sew a quilt of a globe, and embroider the names of my forefathers (and mothers) that lived there and left to come to America. I wish they could write me letters and tell me why they came here so I could know why I'm here. That's the problem of globalization, isn't it? You start thinking way too much about where you come from when traveling or living in a foreign place... We shouldn't take it in a bad way though :) great post.